UPDATE: Good Question Gallery is now online. Check out the link. 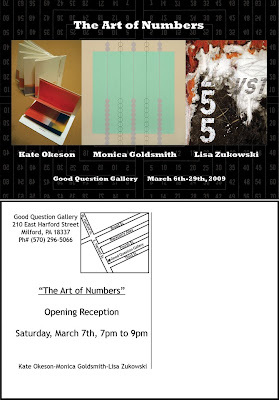 Good Question Gallery is pleased to present the “The Art of Numbers,” a show of recent works by Lisa Zukowski, Kate Okeson, and Monica Goldsmith. This exhibition, the gallery’s first, explores the artist’s common interest in the role numbers can play in the realm of visual expression and what they can say about us as human beings. As a painter, Lisa Zukowski has been highly influenced by Italian architecture. Her thoughtful use of surface texture serves as a touchstone for illustrating the tension between modernity and decay. Zukowski’s nuanced understanding of the exterior wall as a forum for written communication has brought her to use numeric figures in a way that references both the graffiti artists of 1980s New York, and the “note pad” style wall writing of present day Venice. Kate Okeson uses the artists’ book to dissect the ways in which pagination effects our consumption of knowledge. By embracing the abacus as a structural and functional motif, she creates books where page numbers completely occupy both the physical and metaphorical sphere of content. Okeson’s work opposes conventions of order and sequence while asking us to rethink the way we function as both readers and viewers. In her “Subdivisions” series, Monica Goldsmith creates topographically inspired compositions that blur the line between public and private space. Also making use of the iconic form of the abacus, she asks questions that are as much existential as they are environmental. Goldsmith’s geometric abstractions prompt us to consider the unknown quantities of ecological impact and acknowledge the ever-present possibility of a “point of no return.” Monica Goldsmith’s work can be seen in the fall 2008 issue of New American Paintings, No.78. Good Question Gallery is located at 210 East Harford Street, Milford, PA 18337.